The record-breaking sale of Paul Newman’s very own, Paul Newman Daytona, which sold for an unparalleled $17.8 million, reminded the world just how valuable and collectable a Rolex watch can be. Keeping with the theme of ultra-exclusive, one-of-a-kind, Daytona chronographs, Phillips has just announced the standout piece of their upcoming, “Daytona Ultimatum” thematic sale, which is set to take place on May 12, 2018 in Geneva. A one of a kind White Gold Daytona 6265 will be auctioned off. The watch is a reference 6265 Rolex Oyster Cosmograph Daytona, and this particular timepiece is the only known example of the reference 6265 to have ever been manufactured in 18k white gold. 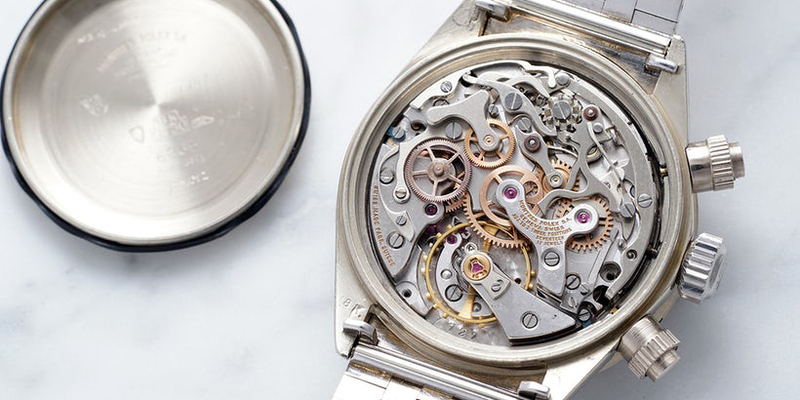 The reference 6265 was first manufactured in 1970, and uses the same Oyster case and screw-down chronograph pushers as the reference 6263; however the reference 6265 was fitted with a metal bezel rather than one made from acrylic. Vintage Rolex Daytona watches were traditionally manufactured in either stainless steel or 18k yellow gold; and while some 14k yellow gold examples were produced for the North American market, this white gold reference 6265 is truly unique, and is the only known example of its kind. The watch was manufactured as a special order in 1970, and sold through a German retailer to its original owner in 1971. The black “Sigma dial” is fitted with matching white gold hour markers, and the 18k white gold case has managed to retain all of its proper hallmarks throughout the years. Most interestingly, despite being an entirely white gold watch, the crown on this reference 6265 is made from stainless steel, and it is being said that this is the proper configuration for the timepiece. Although it was a later addition to the watch, the unusual, white gold, bark-textured bracelet perfectly complements this reference 6265’s vintage aesthetic; and although it was not originally fitted to this exact timepiece, it is still a genuine Rolex bracelet. Additionally, as this was the bracelet that prolific collector, John Goldberger chose to wear on this exquisite reference 6265 while it was in his possession, it has become very much a part of this watch and its unique history. You can see the inner workings of the White Gold Daytona 6265. 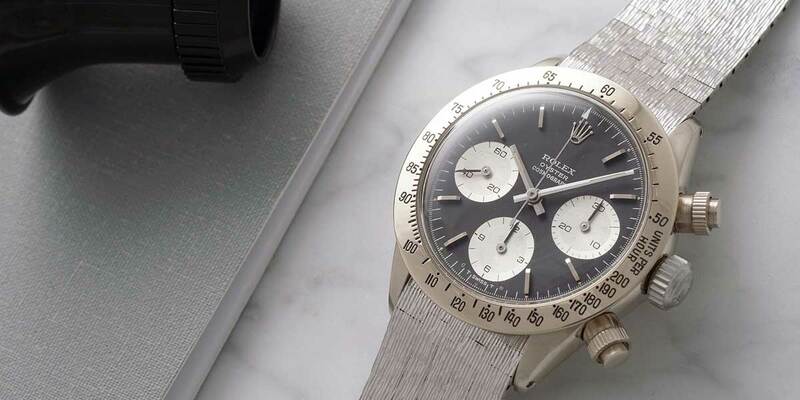 With Phillips calling the watch “The Unicorn” Rolex, the estimate for John Goldberger’s one-of-a-kind, 18k white gold, reference 6265 Daytona is “in excess of CHF 3 million,” which is consistent with the auction prices that other, ultra-exclusive, Rolex watches have reached in recent years. Both Paul Newman’s Daytona and the Bao Dai reference 6062 broke the $5 million dollar-mark in 2017, and seven-figure auction prices are certainly not something that is only achieved by Rolex timepieces. Phillips upcoming “Daytona Ultimatum” thematic sale promises, “an extremely limited selection of the finest, rarest, and best-preserved Rolex Daytona wristwatches known to exist,” and this one-of-a-kind, white gold reference 6265 is a perfect centerpiece for what will surely be a breathtaking collection of chronographs. While the watch itself is absolutely gorgeous and truly about as rare and exclusive as Rolex timepieces get, the most important detail about this white gold, reference 6265 is that 100% of the proceeds from its sale will be going to the charity, Children Action. This noble cause will certainly help to raise its final sale price, and everyone involved can feel good knowing that the massive sum it will fetch will be used to improve the lives of children.